We took these high definition photos showing a bas relief sculpted by Frederic Louis Desire Bogino, which is located on the Aile de Marsan wing of the Musee du Louvre in the 1st Arrondissement of Paris. 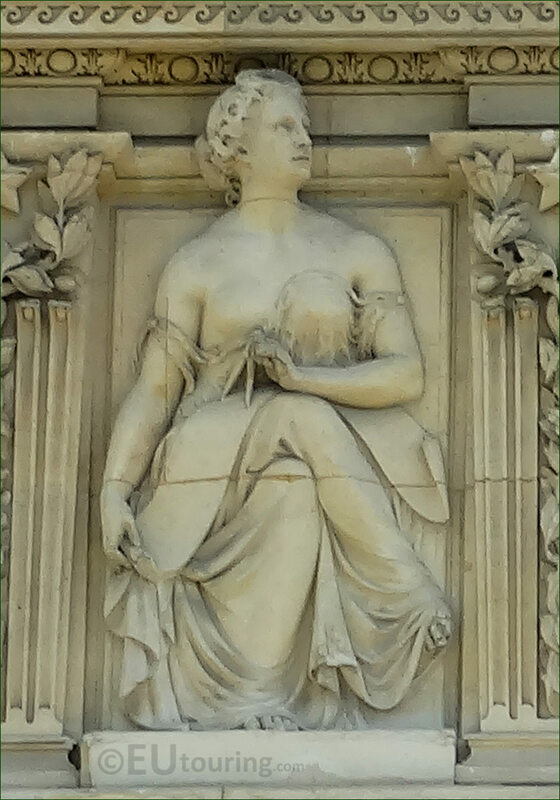 This first HD photo shows a bas relief of a female figure that is referred to as an allegorical sculpture that some places state is called Peace and made of stone she is holding a compass and paper or a scroll, which was placed on the Aile de Marsan of the former Palais du Louvre back in 1879. Here you can see a close up showing the detailing of this bas relief, which was produced by Frederic Louis Desire Bogino who was born in 1831 and entered the Ecole des Beaux Arts in 1850 studying to become a French sculptor under people such as Francois Jouffroy. Frederic Louis Desire Bogino received several public commissions including a memorial for the town of Mars la Tour dedicated to those that died during the Franco-Prussian war, along with statues for the Egllise Saint-Roch in Paris and this plus other sculptures for The Louvre. 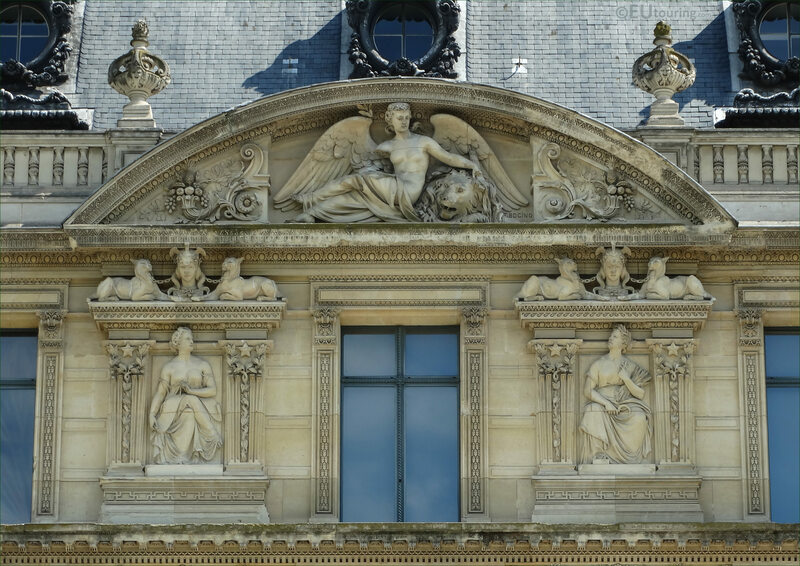 In fact, Frederic Louis Desire Bogino sculpted the two allegorical female figures along with the top pediment that you can see in this photograph, all referred to with the name of Peace, which is Paix in French. 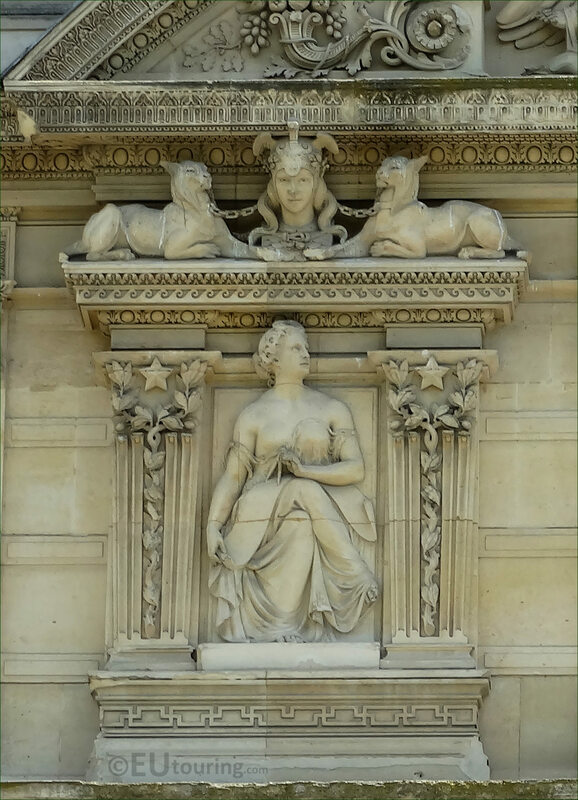 And you can see these sculptures which in the courtyard of the Louvre Museum called the Cour du Carrousel, with this particular bas relief being located on the third level of the Aile de Marsan, to the left hand side of the eighth window, below a pediment on this facade.